N.C. Superintendent of Public Instruction Mark Johnson may have signaled his intent to reduce the testing load for North Carolina public school students, but education officials, past and present, say the new superintendent is going to need some help from state and local policymakers to achieve his goals. The Winston-Salem Republican—who has not responded to multiple Policy Watch overtures for an interview since his upset victory in November—campaigned on the promise to reduce “over-testing” in North Carolina schools, a promise he said former state Superintendent June Atkinson failed to deliver on during her 13-year tenure in the state’s top education post. It comes after more than a decade of multiplying examinations in U.S. schools following 2001’s No Child Left Behind, the federal education law passed at the peak of the public school accountability movement. Today, however, the new superintendent, who has avoided specific promises in his first weeks in the job—opting instead to launch a statewide listening tour for the remainder of the year —seems likely to advocate for state officials to jettison some of the testing load for students. Just how much power Johnson will have though remains to be seen, as many say unilateral action from the superintendent’s office seems a farfetched notion. “It absolutely does not work that way,” says Atkinson. The former superintendent and other top education officials say both federal and state laws, such as the GOP-championed Read to Achieve law shepherded by Republican Senate President Phil Berger in 2012, will complicate matters for Johnson. Critics says the GOP-backed law, while perhaps admirable in its intent to ensure students in the lower grades were on track, only bolstered a system of testing that places students in a perilous position to pass or fail come the end of the year. As former Policy Watch reporter Lindsay Wagner reported in 2014 , Berger’s law, which mandated passing reading tests before students in lower grades could advance, helped usher in expanded early-grade testing from districts seeking to lessen the reliance on high-stakes, “make-or-break” examinations at the end of the school year. Furthermore, with federal laws mandating numerous K-12 tests from third grade and up, and local governments granted the power to approve their own testing exceeding state and federal mandates, control over the state’s numerous examinations may be too far-flung for Johnson’s office to lead any speedy reforms during his tenure, some say. Still, officials who spoke with Policy Watch indicated there is some bipartisan support for streamlining a complicated, time-consuming system criticized by parents, teachers, students and policymakers alike. “We need to reset the importance that has been given to testing in our state,” said Atkinson. To understand where we are, experts say, we need to understand where we’ve been. Early in former President George W. Bush’s first term, education reformers blasted chronically-struggling public schools, many of them located in the nation’s poorest districts, that they blamed for failing students. The answer—according to the bipartisan-approved No Child Left Behind  (NCLB) and, to an extent, its federal successor, 2015’s Every Student Succeeds Act  (ESSA)—is holding schools accountable by strict testing mandates. Federal officials hoped the scrutiny would drive improvement in lagging public schools, but NCLB’s numerous critics, both Republicans and Democrats, say the law instead stigmatized struggling, oft-impoverished, districts and their students. Stuart Yeh is an associate professor at the University of Minnesota and an expert in the nation’s K-12 testing expansion since NCLB. Yeh says the country’s drift toward standardized testing “punished and demoralized” some students, rather than rejuvenating learning in the districts federal reformers hoped to galvanize. “Students were told they were not ready for college, or a career,” says Yeh. His 2016 book, Solving the Achievement Gap: Overcoming the Structure of School Inequality , blames legislation like NCLB for exacerbating conditions in already troubled schools and undermining efforts to bridge so-called “achievement gaps” between students from different racial and socioeconomic backgrounds. Public school advocates agree. Randi Weingarten is president of the American Federation of Teachers, an influential teachers union that counts 1.5 million members nationwide. Weingarten blames the accountability movement with a “national fixation” on testing, which she says has driven teachers away and stigmatized struggling schools. Mark Jewell, president of the N.C. Association of Educators, a Raleigh-based teaching advocacy group, told Policy Watch last week that the movement’s legacy will be high-stakes exams driven with the goal of rooting out poor teachers, for better or worse. It’s not productive for schools or students, argues Jewell, who says the testing accountability movement lacks empirical evidence that it’s had a positive impact in long-struggling schools. Atkinson says the accountability movement has “gone too far” when it comes to testing. Federal officials seemed to heed the widespread criticism when they offered up their 2015 rewrite of U.S. education law, one of the few bipartisan accomplishments of the 2015 Congress. However, as Lou Fabrizio, director of data research and federal policy for the N.C. Department of Public Instruction points out, ESSA, while it grants states additional powers to assess their accountability measures, mostly retains the unpopular testing requirements of NCLB. That includes annual end-of-grade testing in English and math for grades 3-8, as well as at least one examination each in math, science and language arts in high school. That said, Fabrizio notes the new federal law extends some sweeteners to states weary of the testing requirements. 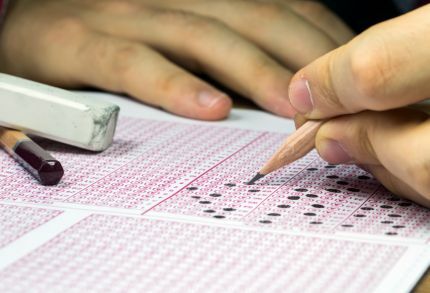 States will have broader powers to determine what they do with those testing results. And federal officials are also offering up funding for states to conduct testing audits. “The assumption, and it’s probably a very accurate assumption, is that if school systems and states did that analysis, they may find out that a lot of the testing they are doing is not something the federal government requires,” said Fabrizio. North Carolina’s testing, in addition to offering the federally-mandated examinations, also includes a state-ordered, third-grade reading test at the beginning of the year to pinpoint students’ needs. Schools also push ACT examinations to test college readiness in grades 10 and 11, both of which could be deemed unnecessary by state leaders. For selected schools, the program orders three, 90-minute “check-ins” in fifth-grade math and sixth-grade English throughout the year in order to gauge students’ progress before final, end-of-grade testing. The concept, officials explain, is educators can use the check-ins to determine students’ needs partway through the year, rather than finding out their pupils’ weaknesses on one end-of-year exam. Lawmakers, worried over tightening budget straits during the post-2008 recession, nixed a 10th-grade writing test beginning with the 2011-2012 school year, but it’s unclear whether any or all of North Carolina’s tests will be shelved or amended in the years to come. Senate President Berger’s office did not respond to Policy Watch requests for comment on testing reforms this week. And Fabrizio could not offer up any specific plans from Johnson, although he says his office plans to meet with the superintendent’s office this week to discuss implementation of ESSA. Going forward, Yeh says K-12 scholars and education policymakers should focus more on changing the way we test, rather than eschewing testing altogether. To Yeh, that means exchanging standardized examinations for “individualized” tests which differ between students’ widely-varying skill levels. Based on Yeh’s research, offering students “modestly challenging” testing is more effective than “overwhelming” lagging students with an exam they’re not prepared to take. And the inevitable criticism that Yeh’s approach simply lowers standards for some? Yeh says the research supports his approach. Examinations, he adds, should provide performance feedback for educators and students, not punishment for lagging schools.